I’ve decided to try phasing out new-fangled (20th Century and later) chemicals in my house by replacing my cleaners and personal care items with homemade equivalents. I want to do this both as an environmental and health measure, but as a cost saving measure as well. For quite a while now we’ve been exchanging hard-core chemical cleaners and personal products for more natural substitutes–like Tom’s of Maine and Seventh Generation instead of [corporate names redacted for potential legal complications]. But these alternatives can be really expensive, and (I’m assuming because they need shelf-stability and FDA approval) can still can contain ingredients that aren’t strictly necessary. With all the wacky health issues I’ve had, I like to keep my additives to a minimum! I’m not anti all chemistry. Soap–saponified lye–is chemistry. Heck, cooking–the application of heat to break down food molecules and kill bacteria–is chemistry, and I like me some roast beast. I don’t, however, trust the rate at which we’re adding newly created substances to our food and the things we slather on our bodies and clean our homes with. As “innovations” from asbestos to aspartame have shown, we don’t always know what we’re getting into when we send new concoctions to market! And so I have been researching recipes for easy cleaners, lotions and other household products which use only ingredients that have been around for centuries and *gasp* work anyway. 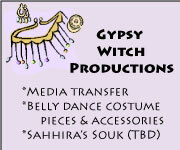 Now as my old stuff wears out, I’m replacing each item with something homemade. 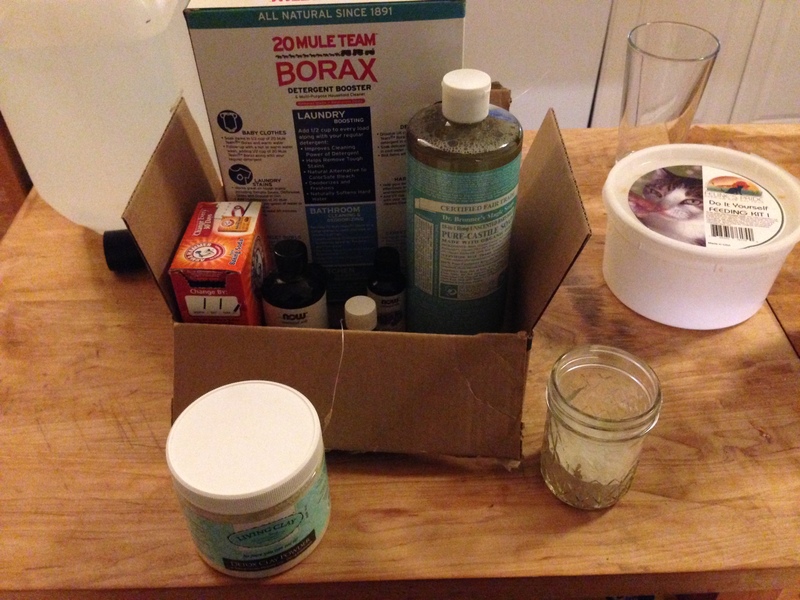 Today I took my first wander through my local crunchy grocery store and pulled borax*, castile soap, baking soda, bentonite clay, sea salt and essential oils off the shelves. I’ve never played with essential oils before, so this part was a lot of fun for me! I got tea tree, lemon, peppermint and lavender to start with. The bill was in the $80s…but I bought, um, a little more essential oil than I needed (did I mention the fun?) and I’m the type of person who will buy in bulk to save down the road. I could’ve done this for less than $40 if I’d bought smaller quantities and not gone quite so crazy with the oils. The supplies I bought plus a few things I already had at home (like vinegar) will cover replacing my all-purpose spray cleaner, dishwashing detergent, laundry detergent, drain cleaner, toothpaste and (with the upcoming addition of some shea butter and beeswax), face wash and lotion for the upcoming rotation. And I’ll still have leftovers of most ingredients if not everything. It was an initial investment, but it’ll save lots of money down the road. The first homemade product I decided to tackle? Toothpowder. A note on fluoride before I get started, as that seems to be a big concern when I mention DIY toothpaste to people. 1) Not everyone agrees that fluoride has more pluses than minuses. 2) TheScott is slightly allergic to it, so it’s definitely got more minuses for 50% of my household. We haven’t used fluoride toothpaste in years and as of yet have seen no ill effects. Personally, I subscribe to the theory that the act of brushing combined with what you eat has more to do with healthy teeth and gums than which product you spend ten minutes a day swishing around your mouth. But that’s another topic. I’ve found toothpaste recipes, but making a powder is much simpler as it only involves mixing dry ingredients and a little essential oil, so that’s where I started. The one I made (linked above) has bentonite clay, baking soda, salt, peppermint oil and dried sage (I omitted the xylitol from the linked recipe). I brushed my teeth with my new concoction this evening. It tasted a little funny at first. Salty instead of sweet and you can taste the sage. Plus when you spit, it’s light green which was a little disconcerting. But my teeth feel smooth and my gums are strangely tingly–a little like when using an astringent mouthwash, but without the eye-watering pain. I’m not sure if I should’ve added more essential oil because my mouth doesn’t feel “minty” like it normally does after brushing. I don’t actually think “minty” is equivalent to clean. I think we’ve trained ourselves to think that because most toothpastes are minty. But, again, it’s a little weird. I’m going to keep trying it. I’ll report back what I think with some time. And if I don’t like this one, well, The Oracle has tons more recipes to choose from! Tomorrow it’s homemade all-purpose cleaner and I’m tackling the kitchen countertops. Do you make any of your own cleaners or personal products? What’s your experience been like? Bigger question…anyone want to join me in a home detox?? I won’t tell you what you should or shouldn’t do, but I’m happy to provide links and resources for all the cool stuff I’ve seen! * Borax as a green cleaner is debatable, and those links will take you to two different articles with different slants. It’s a naturally occurring substance that is neither carcinogenic nor bioaccumulative (i.e. should you accidentally get some inside your, your body can flush it out, unlike, say mercury), but in (really) large quantities it can be toxic. As can iodine. Or salt. Or baking soda. 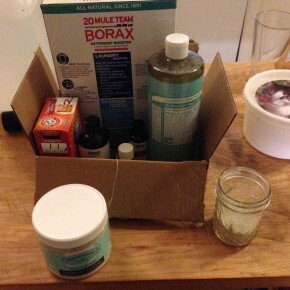 As I’m using small quantities of borax and using it from cleaning not personal products, I’m not worried about it. BUT there are people who disagree with my conclusion. Keep us updated on the ones that work well for you! I use vinegar and baking soda in the toilet but found it too difficult to use on the tile in the shower…it also works well for keeping the drains clear. Vinegar can be used in your dishwasher instead of jet dry if you don’t mind having to dry them when you take them out (plus some spotting). That is all the comes to mind though. I’ve heard the vinegar/baking soda for drains works well and I think I’m going to need to try that soon on my DH’s sink! 😛 I’m still looking for an easy grout cleaner that I can pre-mix. I’m too lazy to mix something up every time I have to use it! Was that the problem with the vinegar/baking soda tile cleaner? Or did it just not work? Well jet dry is supposed to leave dishes spotless and is a drying agent. Vinegar helps with odors and hard water residue. In looking to answer your question, read the comments of this post.http://wholenewmom.com/whole-new-budget/natural-dishwasher-rinse-aid-important-update/ A woman whose husband is a dishwasher repair man chimes in…and provides a recipe for homemade soap.